Sonora® Black Acoustic Board is a low-cost, light weight acoustic board with a black matte facing that has high sound absorption properties and can be installed in various ceiling or wall applications including lay-in ceiling grids. 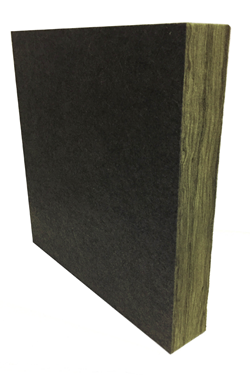 The core construction is a 3PCF or 6-7 PCF Ecose® fiberboard (1" or 2" thick), with a black matte scrim facing. Adhesive, washer plates, impaling clips, two-part Z-Clips. 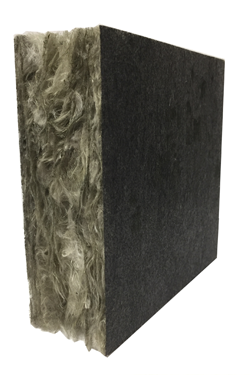 Sonora® Black Acoustic Board provides excellent acoustical performance for auditoriums, theaters, or anywhere broad sound absorption is required. Sonora® Black Acoustic Blanket is a low-cost, light weight and flexible acoustic board with a black matte facing that has high sound absorption properties and can be installed in various ceiling or wall applications. The core construction is a 1.5 PCF Ecose fiberboard (1" or 2" thick), with a black matte scrim facing. Sonora® Black Acoustic Blankets provide excellent acoustical performance for auditoriums, theaters, or anywhere broad sound absorption is required.